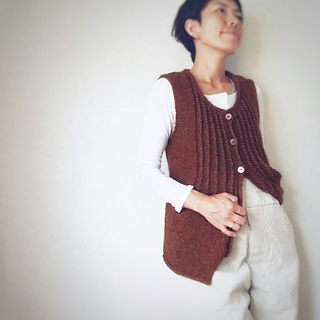 This pattern is available in English. 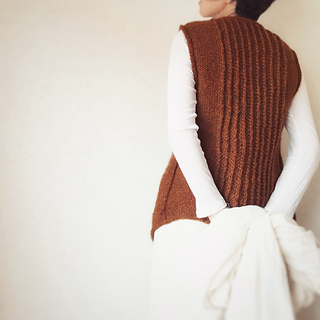 The Juzu vest is worked from the hem to the underarms, then each front and back are worked separate. 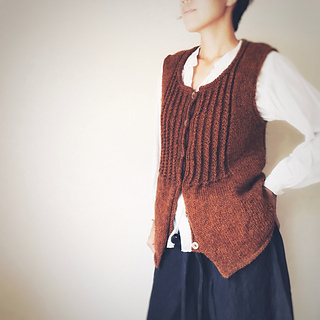 Sizes listed are chest measurements of finished vest, buttoned. Recommended to be worn with approximately 1 - 2 inches of negative ease or 0 - 2 inches of positive ease, due to the stretching construction of the ribs on the back and front of the vest. 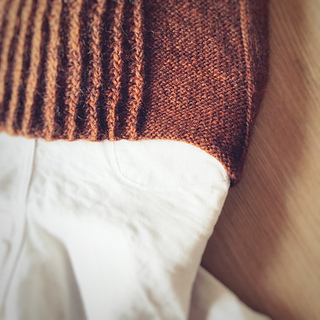 Armholes and neckline are finished as Three-Needle-Bind-Off, using a crochet hook. 5 (6, 7) balls of Ístex Léttlopi (100% Icelandic wool, 109 yards / 100 m per 50 g). Approx 480 (550, 630) m aran weight yarn. 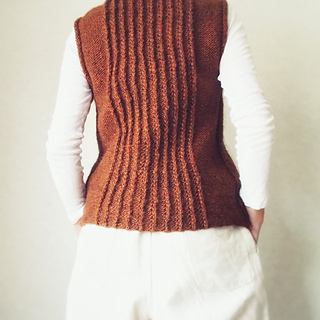 The sample was knit in color Rust heather / 9427 in size 1. US 6 (4 mm) double pointed needles or circular needles for neckline edge and the sleeves edge, US 7 (4.5 mm) circular needles, 40” (100 cm) long for the body. Adjust needle size if necessary to obtain the correct gauge. 18 stitches & 24 rows in 4” (10 cm) in stockinette stitch on larger needle, after blocking. Tapestry needle, stitch markers, scrap yarn or holder, crochet hook for Bind-Off of neckline and armhole edges, 6 (18 mm) buttons. I truly appreciate everyone’s support. 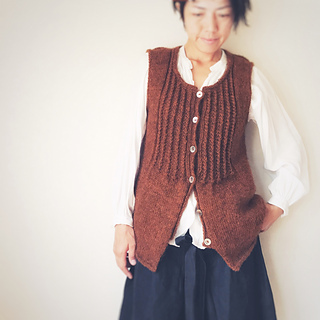 Special thanks to dear test knitters…Hiromi, Miko, Terumi and Yuri of EYLULyarns. Ístex Léttlopi (100% Icelandic wool, 109 yards / 100 m per 50 g) を5 (6, 7) 玉使用。約 480 (550, 630) m. もしくは、Aranくらいの太さのゲージがとれる糸. 胸周囲: 87 (93, 99) cm, サンプルは サイズ1. 綴じ針, ステッチマーカー, 余り糸またはホルダー, かぎ針, ボタン6つ (18 mm).